Winnipeg's population rose dramatically due to immigration in the 1890s. Up to that time, most Catholics were French-speaking or aboriginal and most clergy were from Quebec or France. Now tensions resulted as the number of Catholics of Irish and Eastern European backgrounds grew. A letter published in the Northwest Review on April 10, 1895, said, "In Winnipeg, the largest melting pot in the Canadian West, the difficulties over religion and nationality came to a head." Langevin did provide for non French-speaking Catholics. 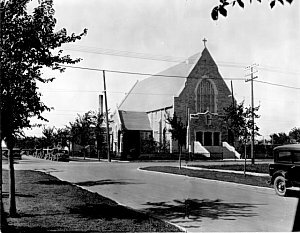 By the end of 1906, there were six churches in Winnipeg. They were St. Mary's and Immaculate Conception (English), Holy Ghost (Polish), St. Joseph (German), St. Nicholas (Ruthenian) and Sacré Coeur (French). The Irish, however, believed that more needed to be done. In December 1906, they presented a petition to Langevin. It contained three main requests. The first request was to create new English-speaking parishes with diocesan priests. 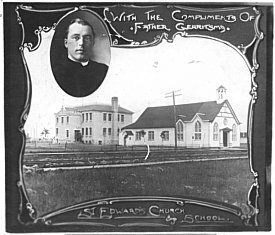 Four of the existing Winnipeg parishes were served by French Oblate priests, and the Irish argued that it was not enough to have priests who could speak English. They felt the need for English or Irish priests who would better understand their ways. The second request was for an English-speaking Catholic college, comparable to St. Boniface College, for the higher education of their sons. When promised new parishes were not created within the next year, the Irish appealed to the Apostolic Delegate Monsignor Sbarratti. Langevin and Sbarratti then exchanged a series of letters. Langevin wrote in August 1907 that he would erect the new parishes "when men and means were available." Finally, early in 1908, Sbarratti warned "that it was necessary, in spite of all difficulties, to erect the two promised parishes as quickly as possible."